An organization’s attitudes toward safety will influence liability loss exposures. Everyone who is running a sport event or training session should be there first for the safety of the athletes and others. Sport risk management is a key component of any sport and recreation program. To run a successful program, not only do you have to look after the safety and well-being of your participants, but you also need to protect the best interests of your organization. Managing Risk in Sport and Recreation: The Essential Guide for Loss Prevention provides all the tools you need in order to design a comprehensive risk management plan that fits the needs of your organization. Written specifically for sport and recreation professionals by an attorney with over 20 years of experience in insurance defense litigation, the book combines information on law, insurance, and sports to give you a complete view of all of the issues involved in assessing, controlling, and financing your risks. Managing Risk in Sport and Recreation uses actual court cases to help you identify possible risk exposures and improve your risk management plan. The book features court case summaries for 14 popular sports and activities, including basketball, American football, soccer, weightlifting, weight training, and triathlon, as well as specific tips on decreasing risk for each of the sports. An introductory chapter explains how to interpret the appellate court decisions and apply the information to prevent similar incidents from happening in your organization. In addition, a court case summary finder sorts the summaries by general risk issue, such as facilities, players, and hazards, to help you find all the cases applicable to particular incidents and provide a broader perspective of how incidents in one sport may relate to others. Managing Risk in Sport and Recreation features numerous forms, including incident reports and repair logs; checklists, such as equipment safety and vehicle inspection; documentation strategies; risk management tips; and safety questionnaires for each of the sports covered. This lawyer-created toolkit will help you take the steps to reduce injuries, decrease lawsuits, and pinpoint the strengths and weaknesses in your sport programs. All of the forms and checklists are also reproduced on a CD-ROM included with the book so you can easily print and use them when needed. 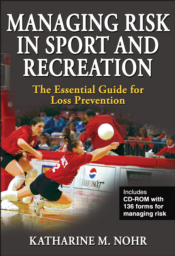 Whether you need to develop a comprehensive risk management plan or just examine the potential risks involved in individual sport programs, Managing Risk in Sport and Recreation: The Essential Guide for Loss Prevention contains everything you need to make the right decisions. The knowledge and tools found in this practical resource will help you create a plan that positions your organization for success. Reference for coaches, officials, athletic directors, administrators, recreation professionals, risk and facility managers, insurance risk managers and loss control personnel, and events managers; text for risk management courses for recreation, physical education, and sport management and law students. Katharine M. Nohr, Esq, is an attorney with more than 20 years of experience handling negligence cases for insurance companies, including matters involving sport, premises liability, motor vehicles, and coverage. Ms. Nohr has served as per diem judge for the District Court of the First Circuit for the state of Hawaii as well as an appellate mediator and arbitrator. She is also the owner of Nohr Sports Risk Management, LLC, which provides education and consulting. Ms. Nohr is a certified USA Triathlon official and certified International Triathlon Union official. She currently serves as the Pacific regional coordinator for officials for USA Triathlon and the safety director for the Honolulu Triathlon. Ms. Nohr has served as the chairperson of an appellate panel for USA Triathlon and has taught sport risk management to USA Triathlon race directors. Ms. Nohr has served on the board of directors and is a former president of the Honolulu Association of Insurance Professionals and former state council director for the National Association of Insurance Women (NAIW). She frequently teaches insurance law seminars and is a certified provider of continuing education credits for property and casualty insurance law and life and health insurance law. She is on the advisory board for the Risk Management Newsletter for Campus Recreation and is also the columnist of The Ball Is in Your Court for that publication. As an athlete, Ms. Nohr has participated in triathlon, swimming, running, and cycling competitions. In her free time, she enjoys swimming, hiking, and traveling internationally. Ms. Nohr resides in Kaneohe, Hawaii.